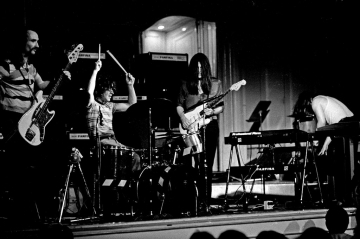 "Spoon" is a song by krautrock group Can, recorded in 1972. It was originally released as a single with the song "Shikako Maru Ten" on the b-side. "Spoon" also appeared as the final track to the band's album Ege Bamyasi later that year. The song marked Can's first recorded use of drum machine coupled with live drums, an unusual feature in popular music at the time. The single reached #6 on the German chart in early 1972 due to being the signature theme of the popular German television thriller Das Messer (after Francis Durbridge). The single sold in excess of 300,000 copies.Due to the single's success, Can played a free concert at Kölner Sporthalle in Cologne on February 3, 1972. "Spoon" was also featured more recently in Lynne Ramsay's film adaptation of Morvern Callar (2004). American indie rock band Spoon took their name from this song, as did Can themselves for their own record label, Spoon Records. "Spoon" was also remixed by both Sonic Youth and System 7 for Can's remix album, Sacrilege.